Welcome to my back deck. The deck is on the south side of the house and gets quite a bit of sun, even with a yard surrounded by enormous evergreens. This is the one place on the property that I can successfully grow basil. I plant this trough with basil, started indoors from seeds, every year. Before I planted out the basil, this year, I was planting the tomato plants that I started from seeds, and I had these 2 leftover tomato seedlings. Not knowing what to do with them, yet, I just popped them in the trough. They've grown well and now I don't have the heart to rip them out. 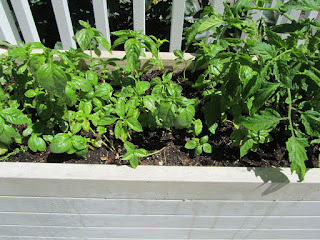 So, to the left, a bunch of basil, doing well now that it has warmed, and 2 tomato plants to the right. Battle of the Mediterraneans. We'll see who wins out. Also, due to being the sunny spot, I have a couple of heat traps on the deck. 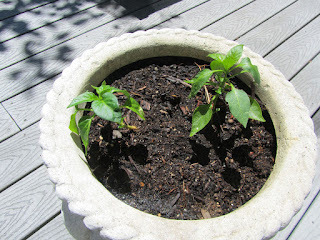 I can't grow peppers worth beans, in the garden, so I'm trying some pepper plants, started from seeds, indoors, in these large pots. I will be thrilled to get some peppers this year. I'm sure you'll hear about it if I get any. Over near the shadier side of the deck (though still sunny for half the day), I have this small area, marking the entrance to the sitting area. 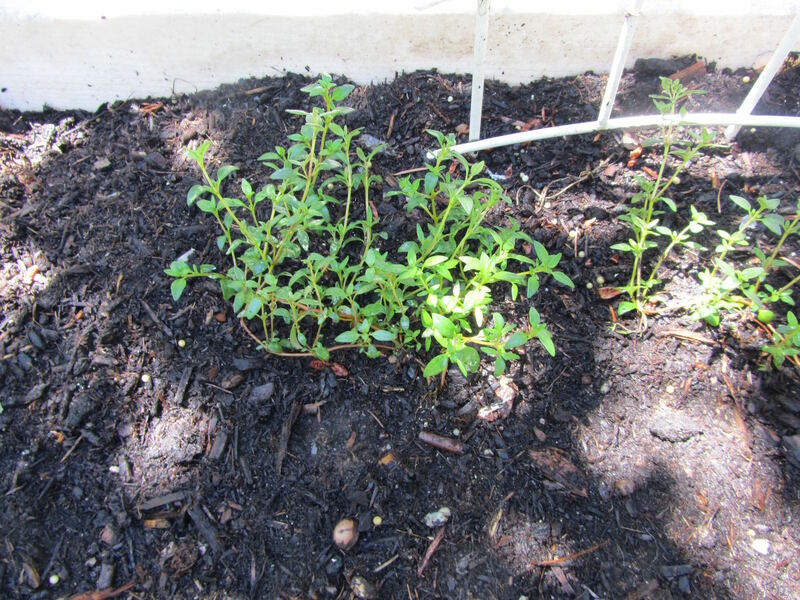 In the large trough, I have English thyme, started from some old seeds (about 6 or 7 years old), indoors. Thyme is known to be difficult to start from seed in the garden, itself. So, I seeded these into a small container and kept under lights for early spring, and moved out to this trough about a month ago. The thyme seems be to doing well, so far. My other thyme is in the herb garden, in a pot. I never get quite enough thyme from that pot, so this trough will provide the rest of what I need. Just in front of the trough is a terra cotta pot with a begonia plant in it. 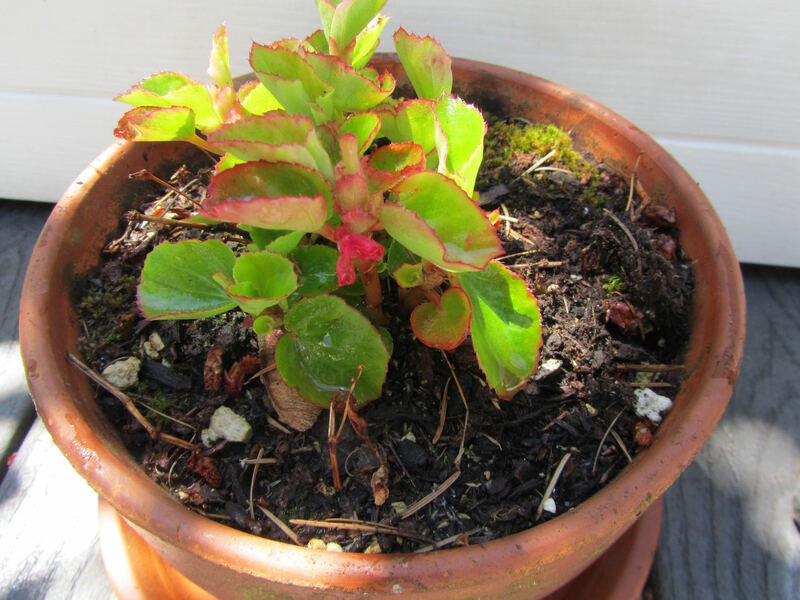 Begonias are not hardy in our area. They either have to be dug up in fall, and stored in a dry place for winter, or started new each spring. I bought 2 tubers and planted 2 pots of begonias a year ago spring. I didn't have time to dig them up, last fall. So one day before a heavy frost, I pulled the 2 pots into the garage, and just kept them there. I didn't water them until I moved them back outside in early spring. I didn't know if they would survive, but they did. Surprise, surprise. So, moral of the story is if you can't do the best thing for the plants, do the next best. 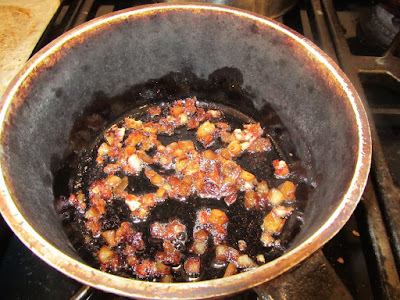 The other pot doesn't look quite as good. It's suffered with an infestation of slugs. Every time it gets one little hint of a flower bud a slug comes along and chomps it down. I slug baited yesterday and hope to bring that pot back to full life again this summer. And behind that spot is the sitting area. It's a pleasant place to sit in mid-afternoon, when the full heat of the sun has passed. 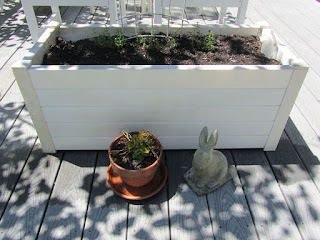 In the back corner of the sitting area are 2 more troughs, one planted with rosemary, the other with lavender. 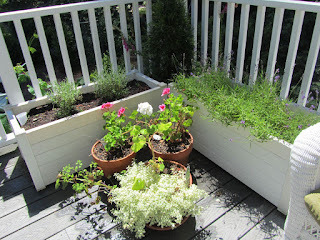 In front of the troughs are the pots of geraniums that I brought indoors for last winter. The pink geraniums I brought inside, pots and all and kept in a south-facing window all winter. 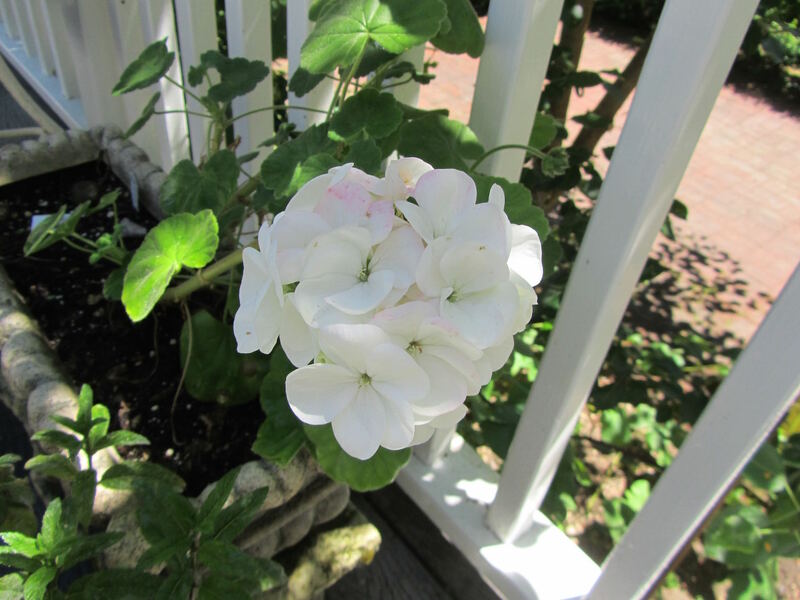 The white geranium, here and in 2 other pots, I dug up and put several into a pot together. Then in spring, I divided the clump of geranium plants and repotted. They were leggy in spring, so I trimmed them back and they've been doing well. 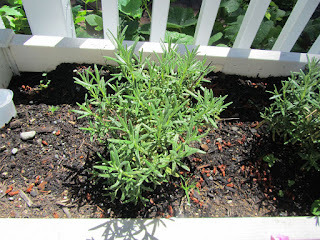 The rosemary, in the left trough, I bought as plants a year ago, spring, after unsuccessfully trying to start from seeds. In fall, I dug them up and potted in smaller pots to bring indoors for the winter. 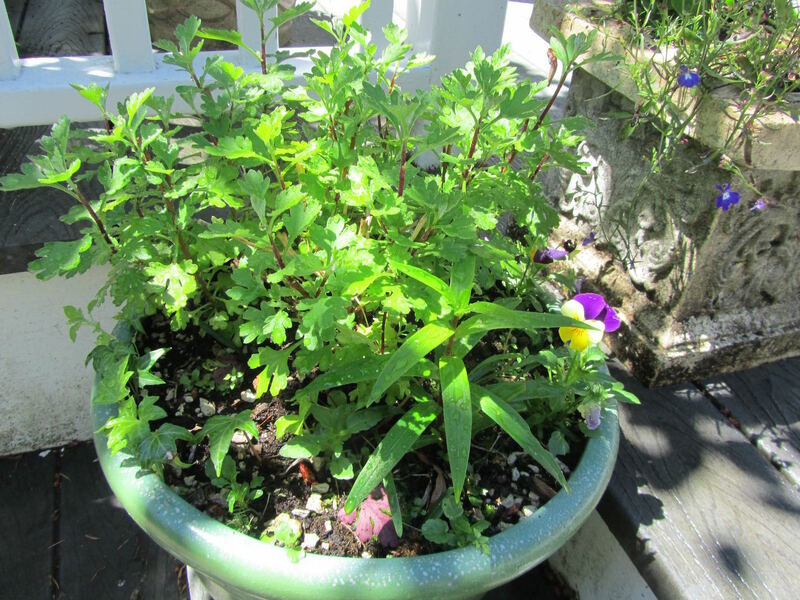 IN spring, I replanted them, gave them a trim to remove legginess and they've popped back to freshness, nicely. 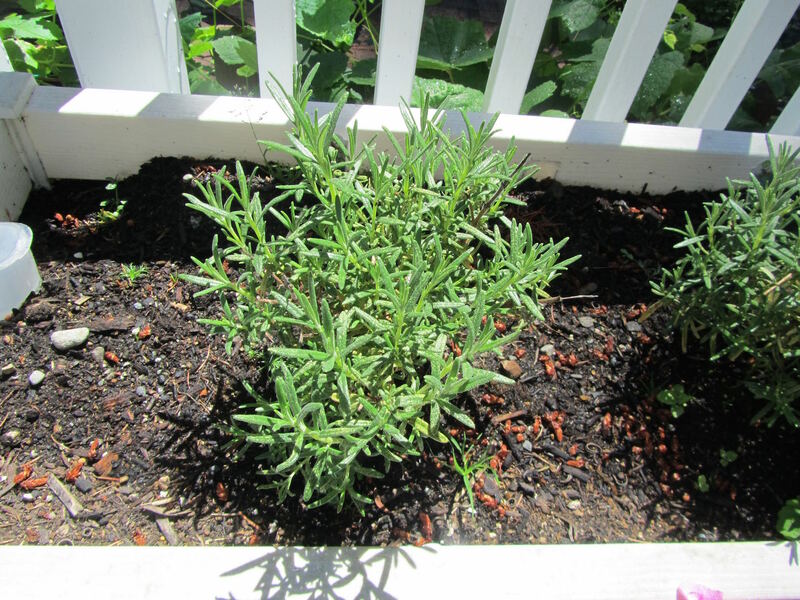 The lavender, I left in the trough (also planted last spring), as I simply ran out of time last year. I just hoped for the best, and pulled the trough right up against the house. It survived, and gave me a lot of buds to cut this year. 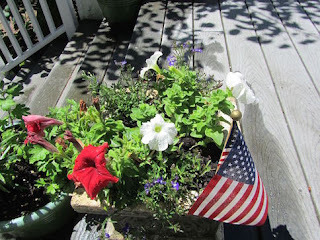 The clearance pots of petunias did not exactly scream 4th of July to me. I had to think, a moment, how I could use the red, pink and white flowers. And as I also came for flowers for the front urns, it occurred to me that I could put the pinks out front, and the reds and whites on the deck. Just below each patriotic pot is a pot of Asiatic lily, violas, and the mums that I bought at the end of last summer. Again, I brought the pots of mums indoors for the winter, and kept in a sunny window, until it was warm enough in my plastic greenhouse on the deck, where I put them for March and April. I trimmed off their legginess, and am hoping for pots of blooms for fall. 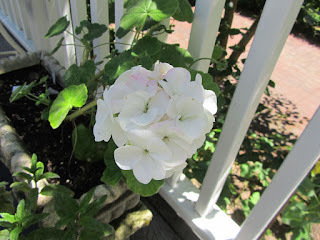 And this is one of the white geraniums that I had dug up and put in a pot with several others, for the winter. they're in a small-ish trough which is too big to bring indoors, as is. So I'll have to dig them again this fall. I'm guessing you see a couple of frugal themes, here. One, as much as possible, I start plants from seeds. 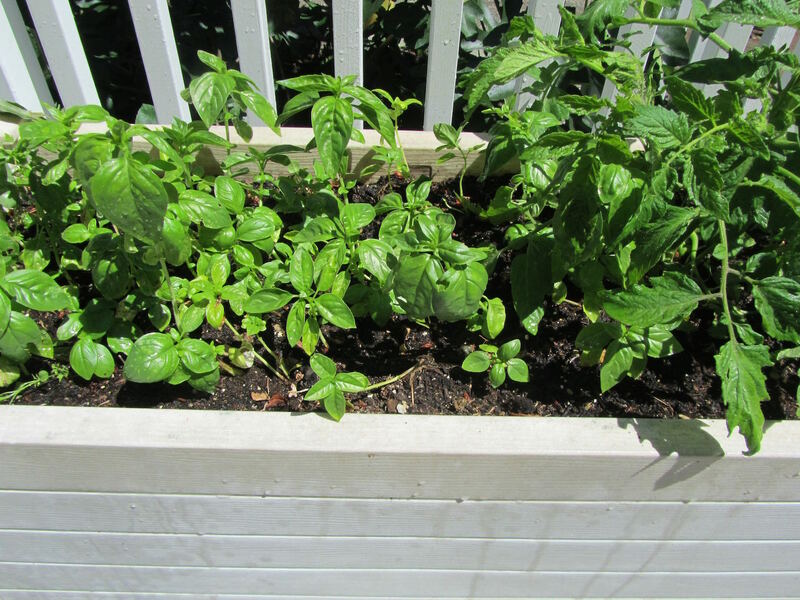 It's the cheapskate way to grow veggies and herbs. Two, as much as I could, I brought flowering plants, which are supposed to be annuals where I live, into the house for the winter, so I wouldn't have to buy the same plants for this summer. And of course, three, I always check the clearance rack of plants at Home Depot for annual flowers. You just never know what you're going to find. You know, you really should have seen my kitchen and living room windows -- filled to the brim with plants for winter. You really do find some great plants on the clearance racks, just needing a little TLC. Yay! For the roses bushes you found. 60% off is a great deal! your deck looks gorgeous and so inviting. Your frugal efforts have served you very well to create a wonderful environment. Yet, your deck looks like a picture out of a magazine. Just imagine how much it would have cost if you had professional landscape doing all the work that you have done. Wow! Thank you! It's my peaceful place to go sit in the afternoons, with an icy glass of lemon balm-mint tea. And I'm so glad that it doesn't have to cost an arm and a leg just to have some flowers for a few months every summer. 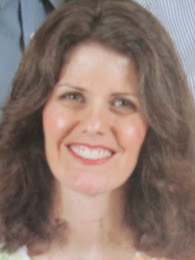 Have a wonderful day, Jayne! I think the plants look lovely. Making a place to sit and enjoy your surroundings is so important. We do that in our backyard sitting on our bench behind the porch where we can just look out into the woodsy backyard or turn to the left to see our flower and herb garden while drinking cup of tea or lemonade. I harvested a good handful of green beans this week and only hubby and I enjoyed those being so few. I also picked two hot peppers and have been harvesting the rosemary as needed. The basil is OK to use a little here and there also. Dad was even jealous that we already harvested and ate green beans! But he is harvesting young carrots. Oh congratulations on the green beans!! Only a fellow gardener would understand the thrill of early green beans! LOL! And basil, peppers, and rosemary. How wonderful! Your sitting place sounds very peaceful, too. With so much work that we do indoors during the days, having a spot to go to, outdoors, is so refreshing. It might only be for 20 minutes, but it really helps me feel "balanced". Enjoy your bench! Oh wow, Lili. Your deck is beautiful and your herbs and flowers make it even more so. I would love to sit out there in the cool of the day. Thank you! It is the pleasant spot for late afternoon, with a glass of iced tea, a few minutes, and time for thoughts. Have a lovely day, Belinda! I am sooo jealous of your beautiful deck....and wonder how you manage to keep everything so clean and white :) I must say since reading your blog, I've taken a lot more interest in how our home looks. I guess this is what happens when we are not willing to improve a home and just spend the minimum on basic maintenance. Yesterday, we finished our pantry closet doors (spent exactly $98 on materials to finish the job.) I didn't realize how irritating clutter is until I could literally shut the door to one end of our kichen. That space was the dining area, but because it was so small it eventually became an area where a stock pile grew. The sliding door adjacent to the dining area was taken out about 20 years ago, so the dining area was completely unfunctional having no windows or doors. Of course, now we don't have a dining room. We just gather in the family room that is the other side of where the sliding door was when we eat. Thank you! Well, everything was just recently cleaned. I try to scrub the deck once a year (beginning of summer), and when I do, I also give the furniture and planting troughs a scrub. The 2 wooden chairs need painting every few years. And one of them now has a rotted slat in the seat that I'll have to figure out how to repair, then paint. Otherwise, the deck railing needs a paint job yearly, but that's it. Good work on the door project, YHF! And I totally understand the feeling of tidiness that comes from being able to shut that part of the kitchen off. My pantry is almost always a mess. It has a pocket door, which I forget to close, a lot. But when we have guests, and I remember to close it, wow, it changes the look of that end of the room. So many homes have great rooms, with a dining area right in the main living room, that having yours in your family room sounds like just about everybody else's house, these days. And you now can stockpile to our heart's content! Again, good work on that project! You are inspiring me to try a tool and wood project. My first will be more basic than you could ever imagine. But I'll post pictures when it's done. I'll send you photos...we used lots of old parts. The closet door tracks were taken from our two bedrooms since we want to replace with another closet system, the four closet doors were made from a very wide, old accordion door, the light fixture was spray painted black to blend with the black ceiling beam, the paint was all residuals from past paint jobs, and the knobs were .89/pr clearance from Kmart. Thanks, I'd love to see how it the doors turned out! You have other priorities, Kris. Besides, you have a live-in gardener! Wow! You've got an entire container garden on your deck. How long does it take you to water all of that every day? There's a patio garden, open to the public, in downtown Seattle that's really amazing. In that garden, they used galvanized tubs, and planted enough herbs, flowers and vegetables to feed a family, but in a patio space not too much bigger than my deck. Anyways, watering . . . maybe 20-30 minutes with a can, or 5-10 minutes with a sprayer. We haven't hit the heat of summer, yet, so I only water every other day, for now. When the real hot days come, I'll water more often. I'd like to set up a drip system, but that will have to wait for another year. 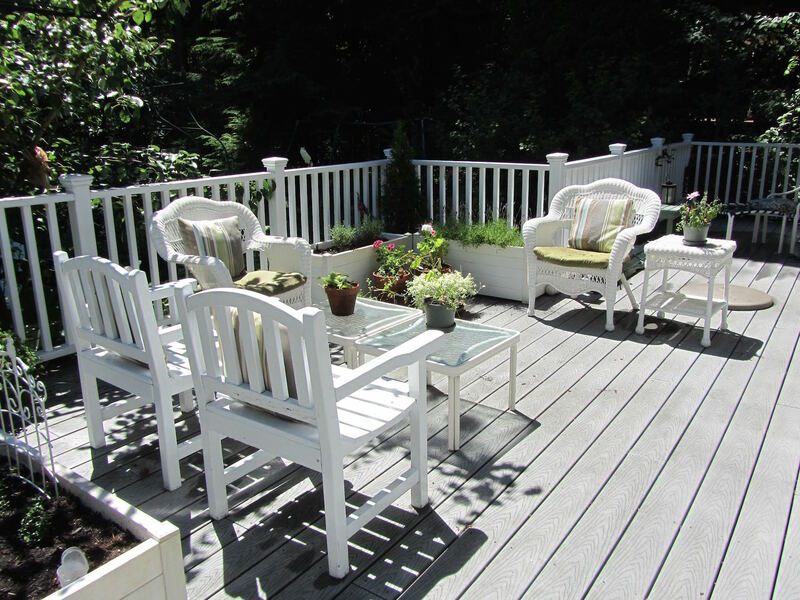 You definitely have a gift for making things look nice as evidenced by your deck. I love taking a volunteer from here and some old seed from there to see what I can grow. I love what you've done with your plants. Thank you, live and learn. Oh yes, I love those volunteers! We've "added" fox glove and columbine to many places in our garden/yard, all with volunteers. And it's always a joy when old seeds actually work. oh no! I hope you can manage something with your laptop to get it working again.